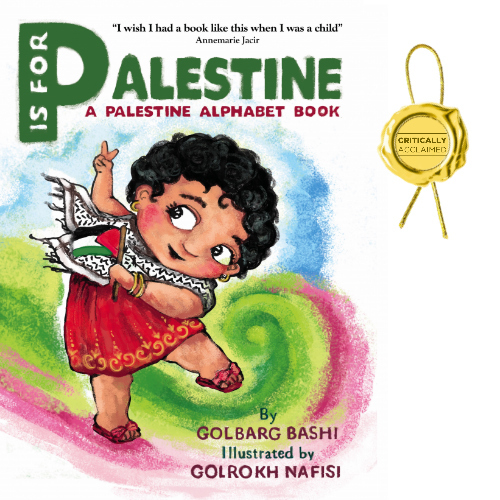 Join us on Saturday, November 18th at 11am for a special storytime as Golbarg Bashi reads from her new book P is for Palestine at Book Culture on Columbus! The story of Palestine is the story of our humanity. It is story of all people, all nations, throughout history, seeking a pride of place. Anyone who has ever been to Palestine (to some also known as the Holy Land) or who has Palestinian friends, colleagues, or neighbors knows that this proud nation, located on the western-most point of Asia, not that many nautical miles away from Cyprus, Alexandria (Egypt) and Greece, is at the center of our world. It is home to the sweetest oranges, most intricate embroideries, great dance moves (Dabkeh), fertile olive groves, and sunniest people! Inspired by Palestinian people’s own rich history in the literary and visual arts, specifically by children’s authors and illustrators such as Naji al-Ali (1938 - 1987), Ghassan Kanafani (1936 - 1972), and Mohieddin El Labbad (1940 - 2010) among others, an academic and children’s author and a socially conscious illustrator have teamed up to create P is for Palestine: A Palestine Alphabet Book—a book for children of all ages where the story of Palestine is told as simply as the English ABC…in an educational, colorful, empowering way, showcasing the beauty and strength of Palestinian culture. We were able to publish P is for Palestine: A Palestine Alphabet Book by financing its publication through the crowd-fundraising platform LaunchGood.com. We are grateful to them and to every single person, bookstore, and institution that took a chance with our newly established publishing house and pre-purchased this book and thus made its publication a reality. Golbarg Bashi is an Iranian-Swedish professor of Middle Eastern History in New York, a children's author and the founder of Dr. Bashi™. She was born in Iran, raised in Sweden, and educated in the U.K and U.S. Growing up in Iran and Sweden, she was widely exposed to the strong tradition of progressive children’s literature in the works published by the Institute for the Intellectual Development of Children and Young Adults in Tehran, Iran and by Scandinavian authors such as Astrid Lindgren, Tove Jansson and Elsa Beskow. In 2016, she was nominated by the U.S. toy industry "Wonder Woman Award" in the Designer/Inventor category for advancing early childhood education through play for languages using the Arabic and Persian-scripts. She lives near Book Culture with her children Chelgis, Golchin and their cheeky cat Bashu. Learn more at www.drbashi.com.